Refuelling with DriveNow in Lisbon - earn driving minutes! However, if your fuel level does happen to be less than 25%, you can benefit! In this case, every customer who refuels in one of our partner petrol stations and drops off the car with more than 90% in the tank will be credited with 20 bonus minutes (with unlimited validity). 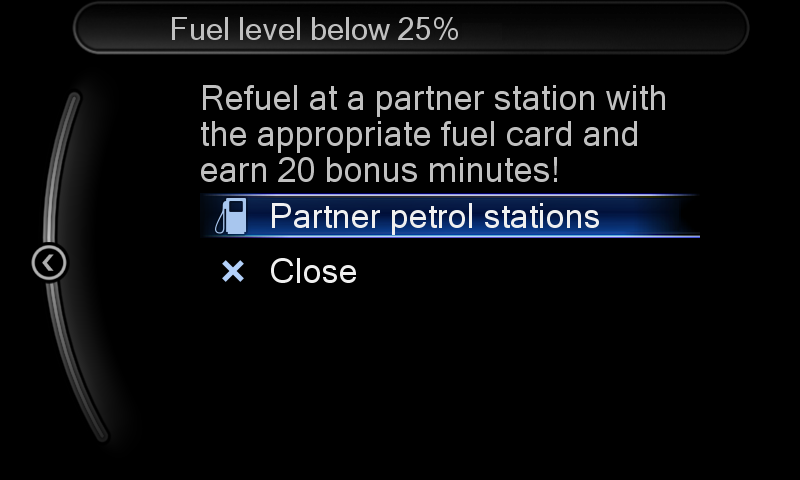 Refueling is only available at Via Verde approved GALP stations, which will be displayed on the car screen once you select "Special points of interest" from the menu. You can also locate the petrol stations using the app. Park only at Via Verde approved pumps, once parked select "Refuel" on the car screen and a PIN code will be shown on the screen. Push the button at the pump and you will be prompted to enter the PIN code from the car screen, then you will be able to refuel the vehicle. You can then unlock your car with the DriveNow app and set off again with a full tank, peace of mind and the gratifying feeling of having 20 bonus minutes!